Ezra-Nehemiah has a greater purpose than to simply give a historical record of Judah’s return from captivity. Though God exiled Israel and Judah from his presence, the prophets promised a day when their slavery among the nations would end. God would bring about a new exodus, gather his people from the nations, and rebuild Jerusalem. God would raise the dead nation and unite all Israel under a king like David who would crush their enemies and fill Zion with joy, peace, and righteousness. We should not consider Ezra-Nehemiah as a complete story of restoration, but instead as God’s first installment of the new exodus and restoration of Zion. Ezra 1-6 recounts how King Cyrus set the captives free to rebuild a house for the Lord. Ezra 7-10 introduces us to Ezra – a descendant of Aaron who set his heart to study, do, and teach the Law of the Lord in Jerusalem. King Artaxerxes not only gave Ezra authority to teach the Law, but he also contributed to the beautification of the temple. 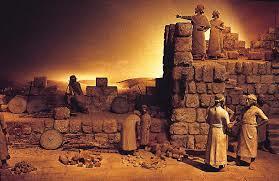 Nehemiah 1-6 tells us how King Artaxerxes gave Nehemiah materials to rebuild Jerusalem’s walls. While the remnant worked hard, God’s help was evident at each point. Many details in these chapters repeat themes from the exodus out of Egypt in similar and contrasting ways. Though the prophets foretold of the nations joining with Israel in worship and rebuilding (Isa. 60:10-14), those who returned faced considerable challenges. Not only did the Samaritans do everything they could to undermine the work, the Jews themselves intermarried with the idolatrous people of the land. In contrast, the prophets had spoken of a restoration where God would place his Spirit in his people and cause them to be careful to obey his laws. A king like David was supposed to execute justice and appoint shepherds who cared for the people. Instead, Jewish leaders took advantage of the poor. The promised restoration was far from what the Jews had hoped. Finally, they had completed their work. Yet, when Nehemiah returned to Jerusalem (Nehemiah 13), he found that the Jews failed at virtually everything they committed to do. They undid much of the work they had done to restore the temple, the Law, and the walls. Though Nehemiah “cleansed them from everything foreign,” this doesn’t remove our suspicion that Nehemiah’s reforms would not last. Since God is clearly at work throughout Ezra-Nehemiah, this result is unexpected. This leads us to ask, why did the Holy Spirit breath out this book? Let me offer three big-picture lessons that jump off the pages of Ezra-Nehemiah. 1. 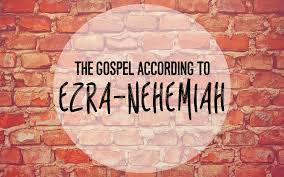 Ezra-Nehemiah builds our messianic hopes. Prophets said the restoration of Israel would happen through a Davidic king and the Holy Spirit. No matter how hard-working the returning Jews were, they couldn’t set the captives free, circumcise the people’s hearts, or restore justice to God’s city. Though in one sense they had been set free, four times the people state that they are still slaves (Ezra 9:8-9; Nehemiah 9:36-37). No matter how much hair Ezra and Nehemiah ripped out, they couldn’t complete God’s restoration. This reminds us to rely on God’s King and Spirit to restore what humans alone cannot restore. If people will not submit to Jesus as King and to God’s Spirit, they aren’t going to submit to humans. God’s kingdom has been inaugurated on earth through Jesus and the Holy Spirit, but the restoration of all things will not come until Jesus comes from heaven. 2. 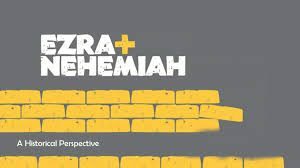 Ezra-Nehemiah motivates us to keep laboring toward the promises of God when it seems futile. God was certainly at work in Ezra-Nehemiah, but his promises seemed to fall short. That didn’t cause the Jews to give up. They worked tirelessly towards the fulfillment of God’s promises. God responded by working through them for the betterment of God’s people and city. God has made the same grand promises to us and he has begun fulfilling those promises in tremendous ways. Yet, we still long for the day when he fully ends injustice, defeats Satan, conquers death, and lives among us in the fullness of the promise. Some days it may not feel like this is the end God is working toward. Some days it seems like the kingdoms of the world will overcome the kingdom of God. The examples in this book motivate us to keep working when it seems futile. Scott Kercheville has been working with the Alston Road church of Christ for four years. He graduated in accounting from Western Kentucky University. He is married to Ashley [Wise} Kercheville and has a year old daughter.